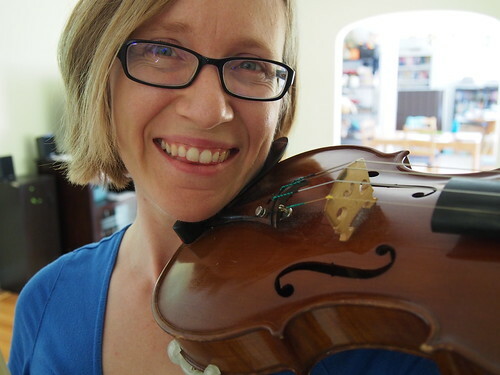 I don’t just make sweaters and hats and cowls out of string(s)…I also make MUSIC! 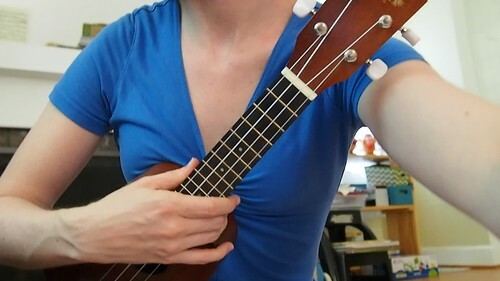 I’ve been playing violin for 25 years now (I started age 10, in 4th grade, in my public school), but as of 9 days ago, I’ve also been learning to play UKULELE! It’s so much fun to be so utterly new at something. I mean, my violin training obviously gives me a little bit of a leg up, but not as much as you’d think. Despite all of the Bach I play, which is FULL of chords, I’m utterly unused to thinking about them AS chords – as I put it, I’ve got a melody + harmony brain, not a chord-brain! But I’m learning…I’ve got 4 whole chords now (C, F, G, and Am) so can already play the chords for quite a few songs (but only if they’re in C!). 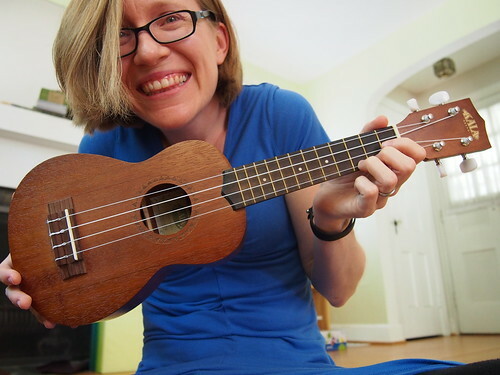 Strumming is definitely not coming to me naturally the way bowing does on violin, and when I’m trying to strum AND sing AND play the right chords, it’s usually the strum pattern that goes out the window, if it’s anything besides a simple “down up down up”. 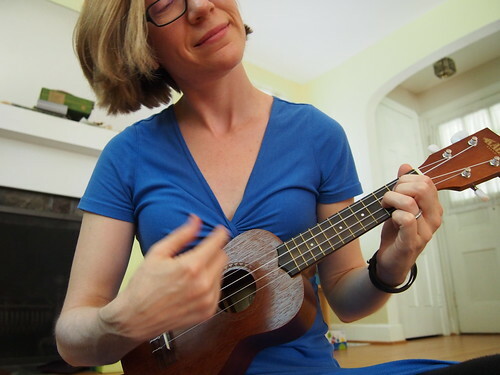 But I’m a stubborn person, so I was determined to get my brain to manage a slightly more complicated strum pattern while singing. And look, I did it! (You’ll have to click the image to see the video on Flickr; excuse my childish singing voice, it’s the best I can do! It’s such a fun brain challenge! I swear I can *feel* new connections forming. Yay, learning! Yay, music! I’m currently working on maintaining/developing my skills with the Bach solo Sonatas & Partitas that I already know, and also working to learn some new ones. My current focus is the Fuga from Sonata No. 1 – I already play the opening Adagio from that Sonata really well (and I *love* playing it!) so I figured I’d work towards mastering the rest of the Sonata. It’s a little slow going, since these days I’m my own teacher, and also the at-home Suzuki parent for my daughter, but I’m definitely making some progress. Maybe I’ll share a video sometime, now that I’m learning how to use my Olympus PEN camera for those and not just my iPhone! 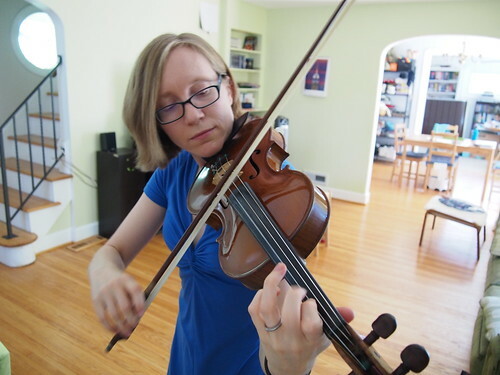 I’m going to get more of a chance to play my violin in a few weeks, when I’ll be taking part in a grown-up “orchestra camp” at my daughter’s music school. I’ve missed playing with other people SO much; my last orchestra concert was when I was 8 months pregnant with M, so it’s been a good long time. Trying to fit it into my schedule, and coordinate the logistics given that we’re a 1-car household, is kind of a mess, but I think it’s going to be fun! Hooray for strings of all kinds! Yay for music! And for subjecting the neighbourhood to open-window practicing! The other day, I was practicing an audition song called “Poisoning Pigeons in the Park,” which is hilarious, but it’s about, well, poisoning pigeons. I definitely spotted one of the guys who works next door smirking as he walked by. Ha, poisoning pigeons!! That’s awesome. My neighbors are just getting to hear me sing Twinkle Twinkle and Blowin’ in the Wind over and over!